We’re thrilled to see our unique widget go live on Cell Signaling Technology’s website this week giving the company’s customers a quick way to see academic citations associated with its products. 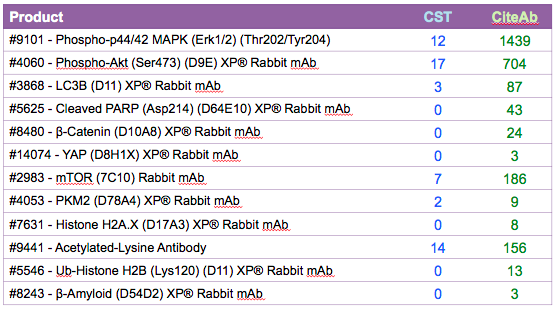 The CiteAb Widget provides an up-to-the-minute live list of academic papers and the antibodies they cite direct to a supplier’s website, with the most recent three up front. We ensure the accuracy of this information by combining cutting edge text mining technology developed in-house here at CiteAb with manual validation by real people from our team. By way of example, here is a sampling of some of Cell Signaling Technology’s product citations before and after working with CiteAb. This list continues to grow and will do so as new citations become live. Dr Andrew Chalmers, founder of CiteAb, said: Past citations are one of the most important factors scientists use to make purchasing decisions. Providing up to date information is a fantastic way of driving sales by demonstrating independent validation of your products. The CiteAb citation widget can be easily embedded onto a supplier website with very little technical effort – we provide the code to allow you to easily install the widget into your website and you purchase a 12 month subscription to our database. This allows you unlimited access to our database with no additional charges of any kind. You can see a example of the widget in action on the Cell Singaling website. If you’d like to learn more about the CiteAb widget do get in touch with Matt who can chat you through how it works.